Over the last couple of years, I have noticed two simultaneous trends about media coverage of GMOs. First, a larger proportion of GMO stories highlight and dispute popular myths surrounding GMOs. Second, the comments on these articles and reasons given to be skeptical or wary of GMOs have not appreciably changed. A recent New York Times article covered a Hawaiian County Councilman’s decision over a vote to ban GMOs on the big island of Hawaii. Although it was oddly somewhat child-like in its presentation of the process (Claim A is brought up. Claim A is disputed. Claim B is considered. Claim B is disregarded…) the tone of the piece was clearly intended to highlight the value of scientific skepticism. That the councilman, Greggor Ilagan, voted against the ban because it was founded on specious arguments portrayed him as a free thinker among a populism-driven council. Naturally, his side lost and the ban was put into effect. Many of the comments on the NYTimes article mirrored those of the supporters who attended the council hearings in Hawaii. A minority defend GMOs as safe and useful tools. The majority, however, assert their beliefs that GMOs harm their health or their environment. Anti-GMO positions usually fall into a few categories: Concerns over the health and safety of eating GMOs. Skepticism of biotech companies (read: Monsanto). Ecological concerns. The benefits of alternative agricultural practices. I hope to spend time with each of these topics over the coming weeks and months. Most are blown out of proportion; many are unfounded. Some, however, do come down to personal stance and belief. The recent changes in GMO coverage appear to stem from a desire by news organizations to avoid false balance. The standard journalistic practice of neutrally informing the public of both sides of an argument is only valid when there are two even sides. When consensus has yet to be reached. When opinions, morals, or ethics are at stake more than facts. The difficult part of covering GMOs as a topic is that this technology encompasses both broad scientific consensus about its safety and opinions about the proper use of GMOs in agriculture. (And that’s all before we get into misconceptions of the facts that influence people’s opinions.) It is difficult to adequately address these different aspects of the public debate surrounding GMOs because they really lie on different planes. Plant scientists won’t rest easy until wishy-washy opinions stop influencing scientific policy. GMO skeptics won’t be satisfied as long as their opinions are tossed out even once the facts are agreed upon (which, by the way, rarely happens). New technologies are messy. My view is that a technological advance is neutral. Our applications of a new technology can be positive or negative. We can split the atom and incinerate cities or fuel them. GMOs have been used fairly conservatively thus far and yet through a combination of pretty terrible PR from biotech companies, an anti-corporate mood throughout the country, and public skepticism driven partly by a false dichotomy between natural and artificial, they remain a pariah in the public eye. Hell, at the end of the day, some would-be opponents say it doesn't even matter. (But ssshhh, don’t tell the commenters that). The debate surrounding GMOs has lately been described as the left’s own version of climate science denial. Sometimes I use that analogy when trying to drive home how one cannot rely on intuition when assessing a new technology. One has to seek out the facts. Certainly no political party is immune to anti-scientific bias and the progressive left has taken up anti-GMO stances for years now. There is no need to equate GMOs and climate change. But there are similarities in the process by which both global warming and agricultural GMOs are attacked. And process matters. My own anecdotal contribution to this layman’s media coverage comes from Reddit. Reddit, popularly understood to be largely made up of young, white progressives from North America, has taken a rabid anti-GMO stance for years. (The voting system of Reddit allows one to determine which opinions are most popular, reddiquette be damned.) I've often joined these comment threads to defend the benefits of GMOs or point our popular misconceptions about the technology. Usually I am called out a shill for Monsanto. Lovely. But over the last couple of years, the top comments have increasingly pointed out misconceptions, biases and untruths in the primary article. More reasonable discussions about the benefits and dangers of GMOs have, slowly, beaten out the vitriol. Perhaps the broader shifts in media coverage of GMOs are in fact slowly trickling through the internet and end up as slightly-more-nuanced discussions rather than ad hominem attacks. If only we could get On The Media to be as interested in this particular topic as they are in asserting that NPR isn't biased! P.S. If Nathanael Johnson at Grist hadn't beaten me to it, a six month adventure of teasing apart the incredibly intricate issues surrounding GMOs would be right up my alley. I’m still catching up with the coverage, but what I've seen so far suggests it is well worth a read. Check it out. Surface. The name is evocative of a blank slate, tabula rasa, a malleable slab that takes what it’s given and becomes what it is exposed to. It sounds somehow more professional, more grown up, than ‘tablet’—literally a ‘little table’. I’m not quite sure how little tables became some of our most prized possessions. It implies clunky and dumb, a resting place for other, more important things. But a surface is something changing and dynamic. It’s something you can manipulate to create something altogether new. It implies flat in the vernacular, but just think of rounded surfaces or four dimensional space-time. Although Pierce later found the Surface Pro did not match this ideal (“In its quest to be both, the Surface is really neither. It's supposed to be freeing, but it just feels limiting.” vis-à-vis performing as both tablet and laptop), it stuck with me. This is what I want my Surface Pro to be. This is what I think it is. Even as I type this at the end of my first week glued to my new machine, I’m still trying to figure it out. It seems to be a common sentiment among everyone but the true loyalists. The Surface is…confusing. Intriguing, in a better light. It’s a curiosity that I think will be recognized among the first devices embodying a paradigm shift in computer-human interactions. That may sound bold, but I’m not trying to announce here a new strain of AI or anything. Consider though our recent history with computers. Computers began as centralized as possible. With the original mainframe computers, workstations were hooked up to a central computer because it was too expensive to consider purchasing every employee their very own machine. A little while later we had individual desktop computers, even personal computers in our own home. But the traditional desktop (an archaic term already—when’s the last time you saw a desktop on a desk?) was still very centralized. It was one of the most expensive and prized possessions in the home. The ol’ family computer back when my mom had to purchase two phone lines because as a doctor she could never be without phone access. But as Moore’s law marched steadily on, computers became cheap enough to spread to every room of the house. I built my first machine in 2006 and that opened up the world of not just a personal computer, but an individual one. A year later, the iPhone was released as the ‘first’ smartphone to see widespread adoption. Suddenly powerful, personal, individual computers were now attached to us 24/7. It quickly showed signs of addiction. So now we had computers at home, at work, in our pocket. But lo! The iPad invented tablets (*ahem*) and now we had computers at home, at work, in our pocket, on the couch. Then small tablets (Kindle Fire, Nexus 7) and big smartphones (Galaxy Note II) came on the scene, each one apparently finding a new niche where very smart people had once declared a saturated market. It seemed that we were incapable of being satiated; a device for every conceivable occasion. But whether we really recognize it as a society yet, I think we’ve become fatigued by this. It’s a sign of good things, for sure. If it weren’t for fierce competition and brilliant devices being designed and released, this wouldn’t be a problem at all. It all happened so quickly. But I think David Pierce was getting at a bigger idea here which is the potential to return to fewer devices. We need phones, so let’s make them smart. But with the advent of a hybrid OS like Windows 8, do we really need two tablets, a laptop and a desktop? That depends on your needs of course, but I think for many people they’ll find that with a suitable tablet and laptop/desktop experience in one device, the overlapping use cases will become superfluous. There’s a trend these days toward minimalism and simplification, and I think that meeting people’s computing needs and wants in a single device (+ smartphone) may fit well into that new zeitgeist. So it is in this spirit that I took a little leap of faith and put some serious money down to be part of this grand experiment. Now, I don’t make enough to be willfully frivolous with my major expenditures. I fully intend this device to last me several years. Maybe not quite as long as my old MacBook Pro. But if I can get three years of daily use out of my Surface Pro I’d be satisfied. But what form will this daily use take? I am still figuring that out, to be sure, but I have some idea now. And to an extent I have a vision of where I’d like it to go. First of all, the Surface Pro is a laptop. It’s an Ultrabook really, although not branded as such. It has a capable Intel i5 processor at 1.7 GHz and 4GB of RAM. 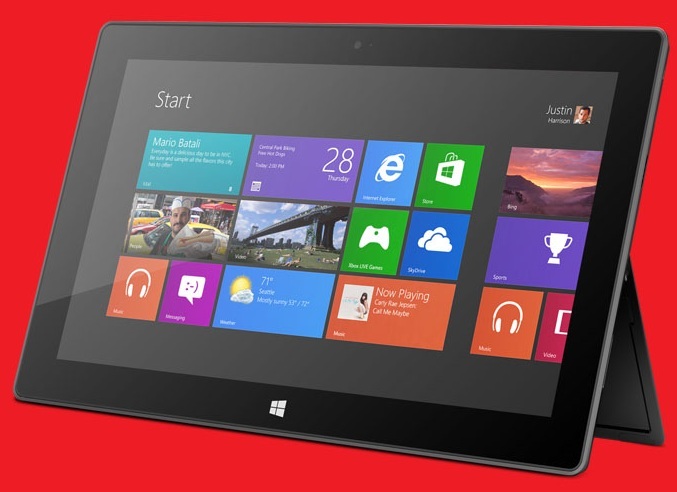 It runs Windows 8 Pro, a full version of Windows 8 that supports all legacy applications. It has a brilliant touch capable screen and a digitizer for full pen support. It has a blazing fast SSD. It’s a powerful, small laptop. Except that it differentiates itself from all other convertible/hybrid Windows 8 laptops on the market by not having a dedicated dock or hidden keyboard. No, its trick is a very sturdy kickstand and a 6mm thick keyboard/cover that snaps on and off with a satisfying click (a 3.25mm Touch Cover is available too but the Type Cover is what makes this a laptop). It most neatly fits the use cases of a laptop, albeit creatively. Some have criticized the fixed angle of the kickstand and the less rigid keyboard cover as serious failings that compromise its primary role as a laptop. But although a fixed angle screen isn’t necessarily ideal, it's at least the right angle. And the viewing angles are generous enough to meet your needs adequately except in the brightest environments. The Type Cover takes some getting used to but it’s really a very fine keyboard. And, critically, it passes the literal test. I am typing this on my lap. What you won’t get is a crazy-angle unsteady-surface use case. It performs best on a desk, to be sure. But so does any laptop, really. This is a laptop first and foremost because it’s a portable computer useable in a variety of locations to do work. The Surface is also a tablet. Detach or fold back the Type Cover, both fluid motions, and you are face-to-screen with a 10.6” 1080p display with 10 point multitouch and an innovative gesture-based navigational system. It’s on the thick and heavy side at half an inch and two pounds (with keyboard removed). And boy is it widescreen; this is never meant to be used in portrait mode. But on a couch where the tablet rests on your legs, it’s a very enjoyable experience. The Start Menu and navigational system are really intuitive and a big step up from swiping through homescreens filled with icons. The pen input is really nice for navigating the Desktop UI while in tablet mode. It approximates the precision of a mouse and lets you dig down into the File Explorer to change a few settings without changing positions. To complete the vision I’ve borrowed from David Pierce, the Surface needs to fill a final role: desktop workstation. I’ll never give up my home desktop because I’ve built it from scratch (several times) and there is no substitute for dedicated graphics if you want to play video games. And I do. But for many people, and for myself at work, this machine should excel as a plug-and-play workstation driver. A larger monitor and Bluetooth keyboard and mouse requires only two plugs, power and display. Snap off the keyboard, flip out the kickstand and set the Surface next to your monitor. Now you have two screens. In my vision, the large monitor for a better Desktop experience while the Surface displays Start Menu apps like Xbox Music or People. A few key Windows shortcut key combos and Windows 8 will function seamlessly even without a touchscreen monitor. The Surface Pro is decked out with all the right specs to push two displays easily and the use of the Mini DisplayPort would even allow daisy chaining two extra monitors if you’d like. Suddenly Excel and Word work flawlessly and you regain the precision of a full mouse for delicate work like photo editing. Unplug and snap on the keyboard to take the same machine to meetings or to a coffee shop. Rip off the keyboard to freehand some notes or doodle on the couch. Kickstand out for Netflix while cooking. Stream to your Homegroup PCs to share a quick YouTube video. Connect to Steam to play desktop-quality games at lower settings on the go. Like legos, reassembling your device to suit your needs throughout the day as your environment changes. I’m waiting on the sale of my MacBook Pro to help fund this final realization. (I’m also waiting about a month to find out where my desk will be for four more years). But more and more I think this is the form I want to see the Surface Pro take. Make no mistake, this is first generation technology. This is the beginning. There are serious compromises and there are no shortage of confused reviewers laying them all out. But I think that many people have forgotten the compromises they make every day. 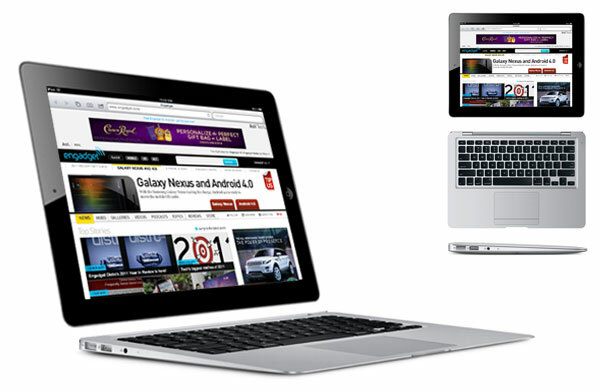 Many reviewers say they’d prefer to spend the same money on a lower-end Ultrabook plus iPad Mini. Or Nexus 7. But that is a compromise that I believe people are just recognizing as such. How to sync between two or three devices. Which to bring along on what occasions. Use cases, use cases, use cases. All the decisions are draining, the power cords tangled, the OS swapping confusing. I’m not making any hasty decisions, but since getting the Surface Pro I’ve taken a peak over at my Nexus 7 and wondered if it’s still as useful as it was before? Now I have a premium Android device in my Nexus 4. The N7 is a little pokier. But it’s small and light and great for reading in one hand. I have a hard time letting go, making this kind of simplification I’m espousing right here. But maybe in a month, or two, or six I’ll find the N7 collecting dust more frequently. Maybe not. The transition is incomplete, but I think that the Surface Pro is a representative example of where computing is heading. A little more centralized. A little saner. With advances in technology, we’ll see a Surface-like machine with longer battery life (eight hours would be a godsend), a little thinner and lighter perhaps. I think Windows 8 is a great operating system to push us in this direction, although I’m excited to see if Apple attempts its own convergence between iOS and OS X anytime soon. And I’m excited to see the final transition to a modern UI that dispatches with the old fashioned desktop tropes that tie Windows 8 down to last decade’s expectations. The Surface Pro is my daily driver, and I’ll try to push it to its limits to see what I can extract from it. I’ll be sure to update with my experiences and how I’ve managed to fit the Surface into my life and if it’s indeed an improvement. But every day I warm more to this bizarre device and I’m excited to see where it takes me. PC Convergence: Compromise or Destiny? It's been not-quite three years since Apple released the first iPad. Already tablets seem ubiquitous. Apple dominated the market against lackluster Android-based competitors until the Kindle Fire came on the scene and opened up the enormous ecosystem of Amazon on a cheap, quality machine. That was barely a year ago. Then the Nexus 7 was born, and the age of Android tablets really began. Apple, despite famously decrying 7-inch tablets as dead-on-arrival, was forced to compete and release the iPad Mini. That's 7.9 inches, they'll have you note. Simultaneously, Apple innovated on netbooks to create the premium MacBook Air, which led Intel to develop the new Ultrabook brand. The Air and it's Ultrabook competition brought for the first time sufficient power and utility down to small scales. Professionals could depend on one small machine for all their productivity needs. And yet, as close as the 11.6" Air and 9.7" iPad are to one another, they face a wide gap. Despite Bluetooth keyboards, and wireless optical drives and productivity apps, no single device has claimed the niche in the middle. The sweet spot. A convergence of tablet and PC, fully capable--at least sufficient--for professional environments with the sleekness, ease of use and chic of a slim tablet. So we go on, keeping tablets at home for the couch and laptops stuffed in bags for meetings. There are two obstacles: operating system and hardware. The operating system is what keeps Apple from success, or even competition, here. It's not an unsolvable problem, but their simplistic iOS--practically unchanged in user experience since the original iPhone--just wouldn't cut it as a PC replacement. And aside from a sleek profile, the MacBook Air doesn't offer any tablet-like amenities. It's not touch friendly. You can't use it face-to-screen, immersing yourself in a smooth experience. Even on the couch, you're separated from your device by the ever-present keyboard. Now Windows 8 is on the scene. For the first time, it's a PC-oriented OS that is built for touch. Yes, it has an awkward duality between the modern interface and the old desktop. It's transitional. But it's a real leap forward. We don't know yet whether that leap of faith will reward Microsoft with sales and prestige, but it has helped push OEMs, led by Intel's Ultrabook brand, to explore the frontier. These machines are true convertibles, more laptop than tablet perhaps, but they are pushing the hardware frontier to see what works and what doesn't. That's innovation and it's a delight to see. And of course, Microsoft has offered it's own take on convergence, the Surface. It might be the boldest attempt at inventing a new niche. So far, it's not exactly selling like hotcakes. But that may be in in large part due to the release of the Surface with Windows RT before the Surface Pro, its beefier cousin. Windows RT doesn't offer backwards compatibility to legacy Windows applications (read: no Steam). Surface Pro is a full-fledged, Intel-based offering in the same format of the Surface RT but with much more respectable specs. It's main compromise is battery life--which is no joke when trying to perfect this format. Surface Pro arrives February 9th and previews have been largely favorable, at least compared to the attention Surface RT received. Will the Surface really define the genre like Apple did with tablets and the iPad? I doubt it. I predict the Surface acts more like a seed, much like how Google's flagship devices helped spur innovation in Android handsets. Now Android is a smooth experience running on premium devices--this was not always the case. And even though Google never got everything right, as the software writers they took the opportunity to showcase their hardware goals and push for Android done right. It may be very much the same for Microsoft with Surface. As the authors of an innovative, if transitional, operating system, it's on them to point in the right direction and say, "Go forth!". Where the hardware ends up, perhaps as Windows 9 rolls around and finishes the software transition, is anyone's guess. I am skeptical of the convertibles that are two pieces, keyboard and screen, stuck together. One is bound to have a piece missing at a crucial time. The Surface has an interesting approach with their Touch and Type Covers that can be detached but serve as useful screen protectors in the interim. Fancy hinges have to be done right. I for one can't stand the idea of the Yoga by Lenovo. As I look to replacing my aging MacBook Pro, and not wanting to part with two grand this time around, I am eagerly considering my options for a convergence between laptop and tablet, a touch-enabled device that is intuitive, productive and engaging. Apple will come on the scene soon, no doubt, but until that time Windows 8 is pushing forward and I am excited to see what comes next.